Discover the five pitfalls most commonly encountered by practitioners when diagnosing and treating dermatologic conditions in dogs and cats, while learning how to fine tune your approach to history taking, biopsies, skin scrapings, and antibiotic selection. Practicing medicine is called “practicing” for a reason. Typically, there is no ONE correct route of reaching the appropriate diagnosis. Many of us find the answers by traveling along our own path, sometimes multiple paths, with a few detours along the way. Veterinary dermatology focuses on the management of chronic diseases and, therefore, is subject to errors because of judgment calls and assumptions. 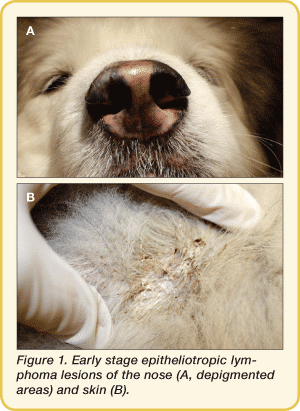 This article focuses on common diagnostic pitfalls seen in veterinary dermatology, with an emphasis on spotting opportunities for improvement. In veterinary medicine, the history often plays an essential role in helping us formulate a list of differential diagnoses. Obtaining a thorough history is CRITICAL and one of the most important parts of the dermatologic examination. Have clients fill out dermatologic history forms. Train your technicians to help obtain information. When did the itching start? If pruritus started at less than 6 months of age, ectoparasites or other infectious causes, along with cutaneous adverse food reaction, jump to the top of the list (as opposed to atopy). Are any other animals in the house affected? Has a new pet been brought into the home? If the answer is yes, then again, ectoparasites rise to the top of the differential list. Consider the atopic dog that was managed well with allergen-specific immunotherapy, but develops intense pruritus and alopecia on the dorsal rump a few weeks after a new kitten joins the home—there’s a good chance that flea allergies are playing a part in the dog’s signs. Sometimes the addition of a new pet means adding another food source, such as puppy or kitten food that includes a protein or carbohydrate source that may affect a food-allergic pet. A pet in the house with food allergies that manages to “snack” on the new puppy or kitten’s food (or manages to get into the kitten’s litter box) may experience a surge in pruritus. Keep in mind that dogs and cats have individual thresholds for pruritus and their responses to various triggers may vary in intensity. Are people in the house affected? Beware of the owner that “just has a rash from working outside.” This owner’s pet most likely needs treatment for parasites prior to further allergy workup. Are the clinical signs seasonal or nonseasonal? In many regions of the country, there are variations in seasonal pollen levels. A dog that is pruritic each year from June through August is much more likely to be atopic versus having a cutaneous adverse food reaction (which would be present year round). Have the clinical signs changed or have they remained the same? 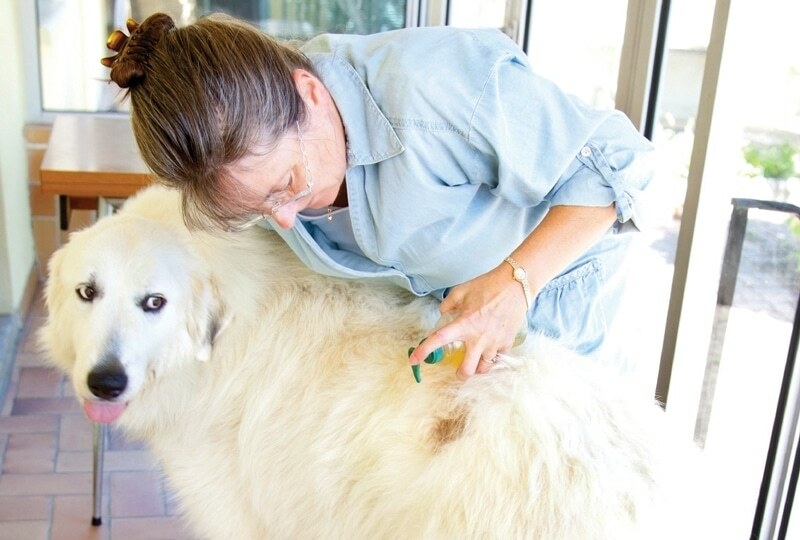 Consider the geriatric patient that has always been treated in the spring and summer for allergies; however, this year, the pet is presented for recurrent infections with minimal pruritus. Focus on changes in behavior, drinking, appetite, urination, and appearance of skin and hair coat. Occasionally, geriatric dogs with chronic atopy become less pruritic after developing an endocrinopathy, such as hyperadrenocorticism, due to increased levels of endogenous cortisol. Has the patient been treated in the past? If so, when, with which medications, and what was the response? Patients that have been treated with several different antibiotics yet still exhibit generalized pyoderma may be infected with drug-resistant bacteria. These pets require culture and sensitivity in order to determine the bacteria present and their antimicrobial sensitivity, allowing the clinician to select the appropriate antibiotic. How many times a day do you observe your pet scratching? Does your pet scratch all over its body or focus on a few specific areas? Is the itching worse in the morning or the same throughout the day? Does the pet lick its paws? Does the pet travel or has it been boarded or groomed recently? Veterinary technicians provide a valuable service by giving you a “heads up” before you enter the examination room. not only can they ask questions to help narrow the diagnostic process, but they can also provide their own observations, such as whether a patient is showing dermatologic signs (ie, intense itching or alopecia). Biopsying lesions early in the course of disease (Figure 1) is important. In addition, selecting biopsy sites along a continuum of the disease process (early-, mid-, and late-stage lesions) can greatly assist the dermatohistopathologist reading the samples. Figure 1. Early stage epitheliotropic lymphoma lesions of the nose (A, depigmented areas) and skin (B). An earlier stage lesion (such as a pustule or papule) or one that has not become chronic and scarred (Figures 2 and 3) is more likely to reveal diagnostic changes. Avoid prepping the sample by doing a surgical scrub. Submit the crusts—even if they fall off the sample—in formalin with the biopsy. The crust can contain important diagnostic information that may help distinguish an autoimmune disease from an infectious process. Site selection is important and selecting the proper site comes with practice. Early depigmentation for discoid lupus erythematosus (which is more helpful than a chronic, crusted erosion). Contact a local dermatologist and ask if he or she can recommend a dermatohistopathologist. Select a dermatohistopathologist and develop a working relationship. Patient responded to treatment and which therapies did/did not elicit a response. Many dermatohistopathologists appreciate digital images. Today’s technology allows you to send an email to the pathologist and attach digital images that are representative of the disease process. Remember, the pathologist is only looking at small, 6-mm samples that have been sectioned into smaller pieces. Digital images provide a much clearer picture of the entire disease process and the likelihood of a more definitive diagnosis. In the past, antibiotic use in dermatology was synonymous with use of cephalosporins. Now, with the advent of the many methicillin-resistant infections (and the social awareness this has created), choosing the appropriate antibiotic, the proper dose, and the correct length of treatment is critically important. In cases of suspected otitis media, the presence of rod-shaped bacteria on cytology indicates that an ear culture should be performed. Speak with the diagnostic laboratory the practice employs to determine the best way to obtain and submit a skin sample for culture. They may prefer a culturette swab or a biopsy punch of the skin submitted in sterile saline for macerated tissue culture. Following the laboratory’s suggestions maximizes the chance of obtaining the best result. Swabs for bacterial culture should be taken from new lesions or recently ruptured pustules or vesicles, not from older, excoriated lesions. An intact pustule should be ruptured with a sterile needle and the contents absorbed on a sterile swab. Some authors recommend a light surgical prep with alcohol, but this may lead to false–negative cultures if the alcohol penetrates or ruptures the fragile stratum corneum overlying the pustule or the pustule opens before the alcohol has evaporated. Preparing a site for a biopsy that will be used for macerated tissue culture (described below) is not the same as preparing the site for a biopsy that will be submitted for histopathology (described in Pitfall 2). To avoid culturing contaminants, prep the skin first by gently clipping the affected area, then gently wiping once with an alcohol swab in the direction of the hair coat. A 4- to 6-mm punch biopsy sample is then obtained and inserted into the appropriate culture medium or sterile saline for submission. Occasionally you will see multiple isolates on your culture report. When in doubt, it is best to choose your initial antibiotic therapy based on Staphylococcus species sensitivity because this bacteria creates a tissue environment favorable for replication of secondary invaders. However, combination therapy is occasionally necessary. Duration of treatment is critical. The recommended duration of treatment for superficial pyoderma is a minimum of 3 weeks (or 10 days past clinical resolution). Deep pyodermas may require 8 to 12 weeks of antibiotic therapy; it is best to continue treatment for 15 to 30 days past clinical resolution. However, not all skin scrapings are created equal. 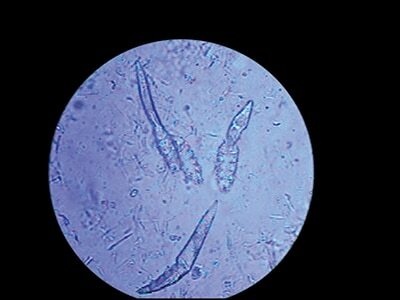 The key is deciding what parasite is suspected—this information determines where and how the scrapings are obtained. Scabies mites live in the superficial epidermis. Unfortunately, these mites are often difficult to find, given the small number typically present and intense pruritus present in the patients. 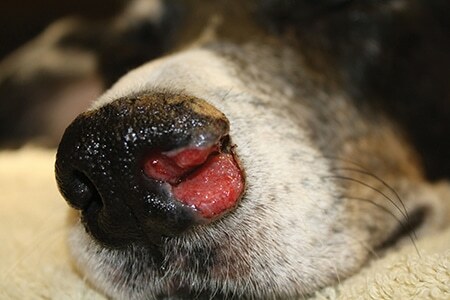 Multiple superficial scrapings are recommended, with a focus on the elbows, hocks, pinnal margins, and ventral chest. It is important to remember that negative skin scrapings do NOT rule out scabies in a dog. If suspicion index is high, therapeutic treatment trials are in order. Appling a drop or 2 of mineral oil onto the skin site being scraped. I find it useful to also dip the scalpel blade in the oil, which enhances the adherence of the scale and flaky material. Holding the blade at a 45-degree angle; then, with moderate pressure, scraping the affected area in the direction of hair growth. “Scooping” the collected material with the blade and transferring it to the microscope slide. Repeat scrapings to accumulate a fairly extensive amount of material. Applying a coverslip and reviewing the slide under low-power objective (4× or 10×), with low-light intensity and closure of the iris diaphragm on the condenser to provide increased contrast between the mites and mineral oil background (see Figure 4—condenser not adapted—versus Figure 5—condenser lowered and low light). Figure 5. Demodex canis: Low-light intensity and closure of the iris diaphragm on the condenser provide increased contrast between the mites and mineral oil background. Squeezing the affected skin to obtain mites that live deep in the hair follicles; then scraping with a scalpel blade and mineral oil until there is true capillary bleeding. Collecting each sample and placing on individual slides. Label the slides to indicate the location of the scrapes, which is important for monitoring mite counts at subsequent visits. Applying a coverslip and reviewing under low-power objective (4× or 10×), with low-light intensity and closure of the iris diaphragm on the condenser to provide increased contrast between the mites and mineral oil background. Determining whether mites are present, counting the number of mites per low-power field, and deciding whether the patient has localized or generalized disease. 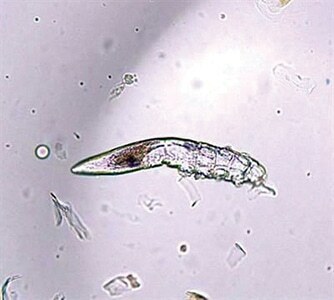 Monitoring treatment progress by distinguishing eggs, larva, nymphs, and adults, along with live and dead mites, each time scrapings are acquired. Despite modern advances in flea control, flea allergic dermatitis is the most common skin disease seen in small animal practice around the world. Why is this the case when newer, more effective products are available and most small animal practitioners are very aware of flea allergic dermatitis in dogs and cats? Not surprisingly, the most difficult task in cases of flea allergy dermatitis is convincing owners that the correct diagnosis has been made. This can be due to the fact that owners don’t see fleas on the pet or won’t accept that their homes have ectoparasites (because it is considered “dirty”), among other reasons. Failure to address environmental issues (especially in severe cases). Talk about the distribution pattern of these diseases’ lesions and let owners begin to draw their own conclusions. If possible, explain potential reasons for treatment failure if previous flea control methods have been ineffective. It is important to tailor every flea control program to the client’s individual life situation. This is where history plays a role yet again. Do you have a client that is afraid of using topical “pesticides”? Perhaps an oral flea preventive is a better solution. The frequently bathed, indoor Chihuahua will most likely have a very different treatment recommendation than the German shorthaired pointer that goes hunting and competes in field trials every weekend. For example, the indoor Chihuahua may be well maintained with regular, monthly oral or topical flea preventive that does not provide protection from ticks. The German shorthaired pointer hunts in an area where tick-borne disease is prevalent and may require monthly oral or topical flea preventive AND an additional product for protection from ticks prior to hunting. Similarly, if these patients live in a household that has several cats that are frequently sleeping with the dogs, it is important to avoid flea products that contain pyrethrins or other compounds that can be harmful to cats. Consider providing a client handout that describes the various flea products your clinic offers and why YOU have chosen to carry those particular products. They trust you and want to know what you think. Lori Thompson, DVM, Diplomate ACVD, is the co-owner of Animal Dermatology Clinic Indianapolis in Indianapolis, Indiana. She is the immediate past president of the Indiana Veterinary Medical Association and is very active in organized veterinary medicine. Dr. Thompson’s clinical interests include allergic skin and respiratory disease, equine dermatology, and immunomodulatory therapies. She lectures nationally on these topics in addition to performing volunteer work. Dr. Thompson is the author of several peer-reviewed articles and is a past recipient of the ACVD Resident Research Award and the Bastien Award for Excellence in Canine Care.